Collection agency license: How difficult is this to get? Many states license debt collection agencies to protect the public from abusive practices and to create minimum standards of operation. The licensing process is often rigorous, time consuming and challenging to navigate. 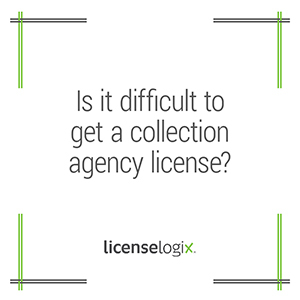 Obtaining a collection agency license is easier when you let the experts at LicenseLogix guide you through the process. A new debt collection agency needs to become fully licensed in the domestic state of the agency. Licenses are generally required when an agency plans to collect debts from residents of a particular state. The application process may require reference letters, samples of collection letters, and lists of all collectors/employees of the agency as well as background checks and fingerprints. Every application is different and all regulatory agencies reserve the right to request further information from the applicant. This is why it is important to let LicenseLogix manage the process of obtaining your collection agency license.